Today we had the pleasure of distributing checks to representatives from local food banks. 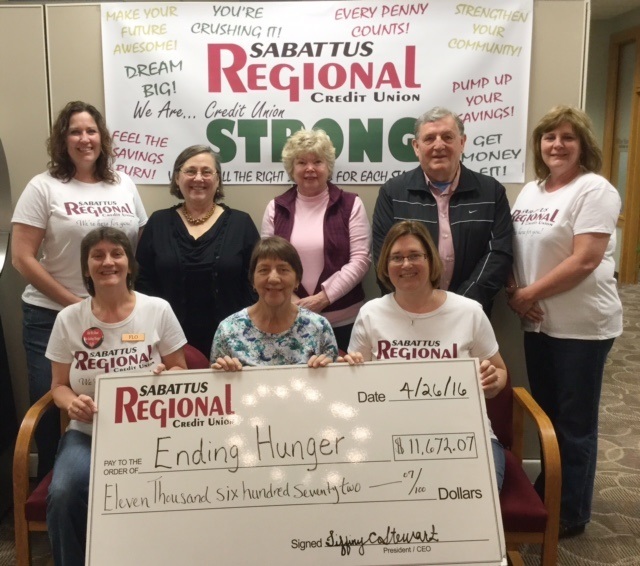 The checks represent funds collected in Sabattus Regional Credit Union’s 2015 Ending Hunger Campaign. Pictured above, back row from left are Tiffiny Stewart with Sabattus Regional CU, Mary Beth Paquette from Rural Community Action Ministry, Faye Neal from Loaves & Fishes food pantry, Eugene Ridley from Greene Baptist Church food program, and Michelle Firczak with Sabattus Regional CU. Front row from left are Flo Poulin with Sabattus Regional CU, Cheryl Stewart with Community Baptist Church food pantry, and Rachel Rac with Sabattus Regional CU. Funds were also distributed to the Carrie Ricker food pantry, Lisbon Area Christian Outreach, Leeds Community Church, Libby Tozier School, Litchfield Community Food Pantry, and Sabattus Primary School.